Discover your smile’s full potential when you use the complete collection of products from the Crest 3D White brand. From teeth whitening toothpaste to whitening strips, Crest 3D White has teeth whitening solutions to suit your oral care needs. It’s easier to unveil your whiter, brighter smile to the world. Make your smile the first step in your morning beauty routine with Crest 3D White Luxe Glamorous White toothpaste. Designed to provide a radiant shine, 3D White Luxe Glamorous White gently and effectively takes your smile from dull to dazzling. It removes up to 95% of surface stains in 3 days, while the unique Whitelock Technology helps prevent new stains from forming. With micro-cleansing teeth whiteners and a refreshing foaming action in Vibrant Mint flavor, 3D White Luxe Glamorous White is a great way to help make every day a glamorous one. -Removes up to 95% of surface stains in just 3 days. 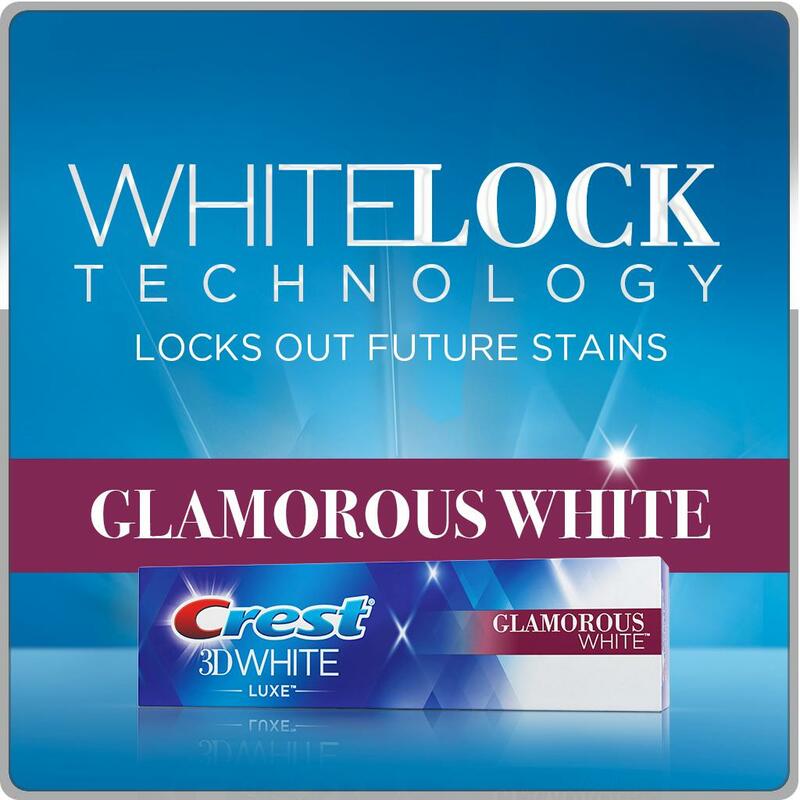 -Whitelock Technology locks out future stains. -Enamel-safe with fluoride to help prevent cavities. You take care of your skin, your hair, your fashion – so why not your smile? Take it from dull to dazzling with the Crest + Oral-B 3D White collection to keep your smile whiter and your beauty routine complete. Q: Is 3D White Luxe Glamorous White safe for my teeth? A: Yes. Like all Crest 3D White toothpastes, Crest 3D White Luxe Glamorous White contains an effective polishing silica that, when used as directed, has been shown to be safe on tooth enamel. The toothpaste not only gently removes the surface stains caused by daily food and beverages like coffee, tea, wine and other stain-causing foods but it also protects against cavities. Plus, it removes up to 95% of surface stains in 3 days for a clean, whiter smile that stuns. Q: Should I alternate between whitening and regular toothpastes? A: There is no need to with 3D White Luxe Glamorous White. It contains a combination of cleaning silica, which are primarily responsible for whitening by removing surface stains with regular use. Plus, it contains fluoride, which will strengthen weakened tooth enamel to help prevent cavities. It is recommended that you brush after meals or at least twice a day. Q: Can I use several 3D White products together? A: Absolutely. In fact, Crest and Oral-B 3D White products provide head-turning whitening when used together, without harming your enamel. For whiter* teeth in just 2 days, use the 3D White collection together. *Whitens teeth by removing surface stains when using Crest 3D White Luxe Glamorous White toothpaste, 3D White Luxe Glamorous White mouthwash and Oral-B 3D White Pro-Flex toothbrush together. Wow I cannot believe how quick my order came. I will definitely be ordering again from Your Essentials!